How do you introduce the importance of dental hygiene to your children? Do you sing songs? How many families out there sing to the tune of “Row, Row, Row Your Boat” the ToothBrushing Song? Families will jump through all kind of hoops to instill good dental hygiene habits at an early age. If singing songs or just telling your child(ren) like it is, isn’t working, then maybe a new approach is needed. Recently launched at the end of March, illustrator, Alexandr Stacanov and TwoTea Applications created Kids’ Dental Health for your iPad device running iOS 4.0 or later. With very few educational and interactive books in the App Store centered around health topics, like dental hygiene, Kids’ Dental Health is very user friendly and well worth the $1.99 download. Turn part of your morning and evening routine into something more entertaining as your child attempts to find hidden sounds on each page. Take on a new persona; Sam, Lily, Daniel or Mia and become a ‘dental defender’. In doing so, you and your child will read about the importance of flossing, applying tooth paste, ridding your mouth of bacteria and eating healthy foods. Open wide and smile to show off your pearly whites as Kids’ Dental Health can be read to you by a professional teen narrator or read by you. Which toothbrush will make sense for your child(ren)? Regardless of which is chosen, this informational and interactive book can be implemented in a number of ways at home and school. Scroll through the four ‘dental defenders’ by simply tapping their smiling faces. Once selected, click the directional in the lower right hand corner and let the adventure begin. If it’s done this way. In reviewing this song and this application we noticed a connection, each stanza of this song coordinates with a page within the book. To rid your mouth of tooth decay, Kids’ Dental Health not only shares factual information in a story like format, but it also introduces new vocabulary. 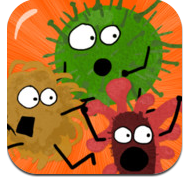 To reinforce vocabulary, zoom in on your mouth as you play the Bacteria game. As quickly as possible, use your fine motor skills to tap away all forms of bacteria built up in your mouth. Notice that some forms of bacteria are more difficult to vanish than others and that toothbrushing needs to be done efficiently. A note to the developers – while playing the Bacteria game might it be possible to have an inside look of a scrolling mouth, indicating where possible bacteria will land. By brushing away the bacteria, you become a knight or magical fairy equipped with a toothbrush sword or wand. Just as the song indicates, our story also continues as it shares the significance of flossing. Flossing for some children and yes, even adults, can be challenging. To guide our readers, developers have included a narrated graphic of techniques or strategies for best flossing, however, Applicable2U thinks a video presentation would be even more effective. Now that your ‘dental defender’ is equipped with a toothbrush and some floss, they have been protected for the day. Motivate your child towards a healthy, shiny smile in just 10 short pages. If your toothbrush and floss are not at your disposal during the day, don’t panic. Be sure to eat healthy and make regular visits to the dentist twice a year. If you don’t have time to read the whole story, simply click the page icon from your main menu screen and let the reinforcement continue. Kids’ Dental Health could not have come at a more appropriate time as my own ‘dental defender’ tends to argue over having to brush his teeth. By making this interactive, informational book a part of our bedtime routine, teeth brushing hassles will become a thing of the past. At this time, there is only one interactive gaming feature, however, 3 additional games are coming in a future update for free. If your child’s doctor has indicated that it is time to start brushing their teeth, then downloading Kids’ Dental Health to your iPad device is an excellent addition to your iTunes library. Are you a family whose children have been brushing their teeth for few years, but put up a fight, then it’s time to learn and play towards a healthier mouth. Even an early elementary classroom teacher can benefit from downloading Kids’ Dental Health as it meets curriculum requirements for those in preschool-1st grade. Applicable2U would most certainly give Kids’ Dental Health two thumbs up!! We are looking forward to continuing our mouth journey in future updates. If you would like to learn more about TwoTea Applications, please visit their website here. To add Kids’ Dental Health to your iTunes library today, simply click here. Dr. Seuss is one of the most beloved children’s author that I know of. His books were written for the youngest of new readers, but are still being implemented and shared within the higher elementary schools. When our school meets as a large community, book sharing and personal connections are usually the key to our conversations. Many of Dr. Seuss’ books have been apart of our community meetings as they can spark connections to real life. When you visit any popular book store, you might notice that a collection of Dr. Seuss’ books are being sold in hard cover. Well, now those same collections that are found in hard cover can be accessible via your mobile device, thanks to the efforts of Oceanhouse Media. 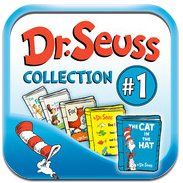 With the recent launch to the Apple Store, Dr. Seuss Beginner Book Collection #1, you can now choose to read many books while on the go. With no surprise, this book series was ranked #9 in the Paid iPad Book Apps store as of February, 2012. This first series includes: The Cat in the Hat, The Foot Book, One Fish, Two Fish, Red Fish, Blue Fish, Fox in Socks, and Mr. Brown Can Moo! Can You? Applicable2U has reviewed a number of books converted to mobile device from Oceanhouse Media. With each return visit or new download of a book by this development group, reading time with my son is enjoyable for all those participating. As he nears the 1st grade, his reading abilities are certainly improving and the various reading opportunities that those hardcover turned mobile book apps are providing him are amazing. According to their iTunes description, this book series offers some new features only OMBooks will include: “professional narration, background audio and enlarged artwork for each scene. To promote reading in young children, individual words are highlighted as the story is read and words zoom up when pictures are touched.” Navigation between books is very user friendly and will provide a different experience each time a book is read. Even before a book is opened, users have a character choice screen. With brilliant resolution, the character chosen will fill with clear, crisp colors and its coordinating book cover will appear center stage. Like most book apps, young readers have three ways that stories can be read: Read It Myself, Read to Me, or Autoplay. Each experience has a valid reason for choosing as your little one develops their reading skills. With each of these reading experiences come some amazing features. In all three modes of reading, young readers won’t have a problem trying to figure out where they are on the page. Their eyes can navigate from left to right as words are highlighted as they are being read. In the “read it myself” and “read to me” modes, readers can tap objects on the page and the narrator will announce what it is and where it can be found within the text on that page. On some rare occasions, you may even tap an object and a new vocabulary word that is not in the text will appear. A wonderful way to encourage language, details and descriptions. The autoplay mode has this feature as well, although it doesn’t seem to flow as nicely since the autoplay mode is like watching a movie and there didn’t appear to be a stop/pause option. Interactively, pages can be read, tapped, swiped and even heard as sound effects are added in here and there. Another great feature that we like about this book series is the resume or start from beginning option. If you have read any of Dr. Seuss’ hard cover books, then you know that some of them are rather long. If your nightly routine begins late one evening or you only have time to read a little, then don’t panic. OMBooks knows that you have left a book and puts a magical, almost virtual like bookmark in its place. Spending time reading is critical! Reading can now happen in so many different ways and our children need us to model those behaviors. Oceanhouse Media Books currently has this under control. Someone might say, why should I pay $11.99 for the mobile version of Dr. Seuss Beginner Book Collection #1? Why not, most families, classrooms or library book corners have them as hard cover books. Oddly enough, you spend just as much money for those, if not more. With schools transitioning to 1:1 experiences or that have mobile devices for the classroom, why not spend the money? Books won’t get ruined or ripped. Children of all ages, learning styles and reading levels can be accommodated. With this download, now all five of these amazing stories can be easily carried and won’t be left behind. If you would like to learn more about this or any other book applications that Oceanhouse Media Books has to offer, please visit their website here. Dr. Seuss books are applicable to you, so begin downloading this first collection series today by simply clicking here to access it in your iTunes library. Its time to stimulate your mind with an app for your Apple device that has the feel of an oldie but goodie electronic light up game, “Simon.” Vinny vs the Curse of the Incas is categorized as an educational app because it develops ones concentration and memory. Designed for late elementary to middle school users. It is intended to challenge those using, yet rewarding as you successfully defeat a nasty curse. Navigate from San Francisco to the Peruvian jungles of South America while playing six memory games. As you explore, you are no longer some random person, you are now a special agent working alongside private investigator, Vinny and his friend, Cheeks. Unfortunately, Vinny has amnesia and needs your help. 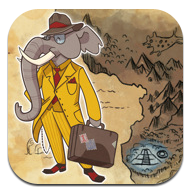 He needs your help to solve various puzzles in order to defeat the curse of the Incas before it’s too late. So what’s your memory quotient? Unsure of what memory quotient means? No worries! The memory quotient refers to three types of memory skills that this app will test: spatial, sequence and set memory. Your memory quotient will be calculated as you play: List Memory, Scramble, What Doesn’t Belong, Repeat After Me, Tile Matching and What’s Missing. Before the adventure can begin, add your trainee name to the file by clicking the picture of Vinny. This interactive mission can have multiple trainees. As a family, play Vinny and the Curse of the Incas. As achievement awards are received, see whose memory quotient is the best. Your travels can occur in one of two ways, quick play or adventure mode. Try not to panic when frustration sets in. The developers have taken this sense of “giving up” into consideration. To relieve some built up tension, simply click the question mark in the lower right hand corner. Here you will find quick, yet very useful tips or suggestions for both parent and user. Like anything in life – practice, practice, practice!! Applicable2U is impressed with the direction of learning that Robochan has taken. With eye appealing artifacts or graphics, a school connection can be made as trainees recall their study of the Incan empire. An app which stimulates the brain as it strategically works on your concentration and memory, skills which can be applied in school and at home. Vinny vs the Curse of the Incas keeps you coming back for more. Applicable2U will continue to keep an eye out for future updates. We noticed Vinny’s note on his desk stating that a store was coming soon!!! If you would like to learn more about Robochan, please visit their website here. If you are looking to increase your concentration or to develop memory strategies, then begin downloading Vinny vs the Curse of the Incas from your iTunes library here. My first experience with Tales2Go was at the beginning of the New Year. It had come across my Twitter feed to check out their on demand audio book application. I was instantly intrigued to find a Pandora like app but for children’s books. There are a number of adults who travel long distances to get to work and find themselves listening to books on tape, why not have that same experience for our children. The Tales2Go app can be downloaded for free, however, in order to hear the books you will require a subscription. In addition, if you are like me who has an Apple device without the data plan, then the listening will happen in the comfort of my own home or in a location that I can pick up free Wi-Fi access. One of the many great things about this app is that they provide a free 30 day trial to make sure that you and your child will truly enjoy all that it has to offer. At the end of that trial period you can decide if you want to continue for a month, 3 months or even a year. I was amazed at the number of books that they had streaming. 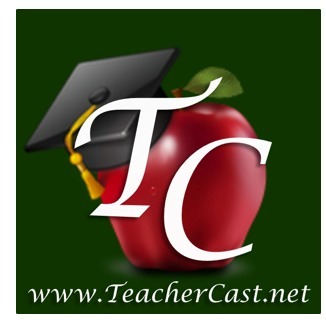 For those parents/teachers reading this review, this app is not just for the younger student. This lends nicely to all ages and grade levels from Pre K – 8. There are songs and a variety of authors like Junie B. Jones, Goosebumps, Diary of a Wimpy Kid and Boxcar Children just to name a few. As a teacher, I could definitely see this fitting in nicely to any classroom setting. As I explored this application, I thought of our struggling readers and how they could find a love of reading by hearing those books that they want so badly to read. I can just visualize students sitting all over the room during DEAR (Drop Everything And Read) time as we call it with earbuds on as it plays on an iTouch or iPad. Students can make bookmarks so that they can access books quicker and can star those that are their favorites. Tales2Go also has a category for various genres. Why not hook up a set of speakers to your Apple device and share a book from the genre that you happen to be working on that month. Once finished, a teacher could have a number of follow-up activities like : a classroom discussion, have students illustrate a section of the book, or even comprehension questions that they are to answer in a journal. 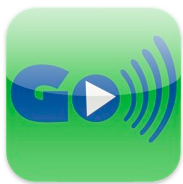 If using Tales2Go can not happen in the classroom, then why not use it at home. It’s a great addition to any homeschooler or just as a parent getting their child to love reading! If you would like to learn more about Tales2Go then be sure to check out their website. Or you can download the free application by visiting them in iTunes here.